Two-bedroom apartment with beautiful city skyline views. 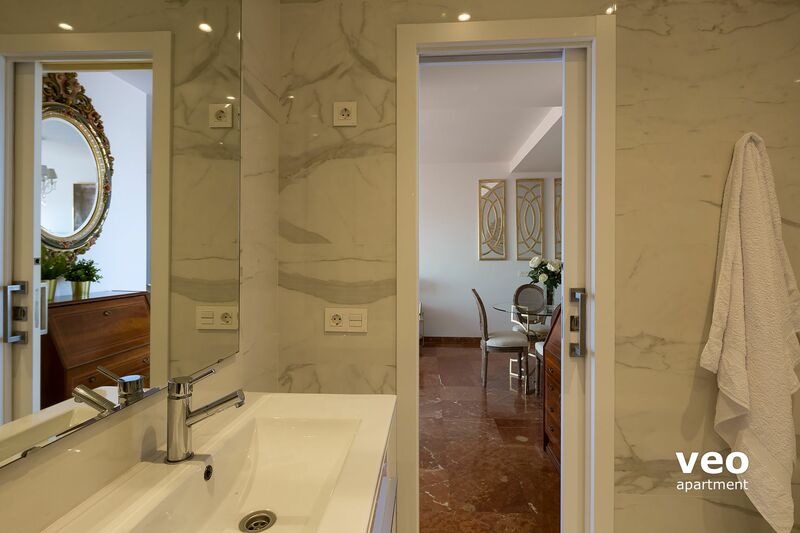 It is centrally located on calle San Pablo, next to Plaza de la Magdalena, and 5 minutes' walk from the Cathedral. Suitable for up to 4 guests. The elegant interiors are decorated in a classic style combined with modern features: details include, red marble flooring, dark wood furniture and original art works. Huge windows provide a great sense of light and space. Enjoy the open views over the rooftops, churches, tower bells and bridges. The open-spaced living area has a sofa, armchair and coffee table. Dining table with 4 chairs. There is a large TV and free WIFI internet access. Air-conditioning with cooling and heating. The modern kitchen is well equipped with all main utensils and appliances, including oven, washing-machine and dishwasher. Bedroom 1 has twin beds (0.90 x 200cm), a fitted wardrobe and a large window overlooking Seville rooftops. There is a family bathroom with an ample walk-in shower, next to bedroom 1. Bedroom 2 has a double bed (150 x 200cm) and a wardrobe. A window faces an inner patio of the house. The second bathroom is inside bedroom 2. With shower, washbasin and WC. The apartment provides unique skyline views over Seville from a 6th floor, with elevator. Despite being in the centre of the city, it is quiet and peaceful. Parking Magdalena: 19 EUR / day (rate subject to changes). Parking located right next to the apartment. El Centro is the neighbourhood at the very heart of historic Seville. With the majestic Cathedral at your doorstep, el Centro begins at the Plaza de San Francisco, location of the elaborate City Hall, one of the best examples of plateresque architecture in Spain. The City Hall leads you to the main shopping area with it´s famous parallel shop-lined streets: Sierpes and Tetuan. This busy area is the place to come for clothes, sporting goods, jewellery and Sevilla Feria fashion: shawls, flamenco dresses, castanets and fans... The Palace of the Contesa de Lebrija is nearby, home to the famous Pan Mosaic which dates from roman times. Heading northwest towards the Guadalquivir River is the Museo de Bellas Artes, the city’s Fine Art Museum, one of the most important art museums in Spain after Madrid’s Prado. The collection includes important work by Murillo and early Velazquez. Parking garages Reduced car parking rates. Public transport & Taxi From the airport & around the centre. Airport transfer Directly to the apartment door. You are required to pay 20% of the total apartment rental to complete your booking. The balance must be paid in cash upon arrival. The other option is to pay the balance by bank transfer, at least 7 days prior to your arrival. Please request account details by email. 15:00 to 22:00h. Late check-in from 22:00h: 20 EUR (to be paid in cash, upon arrival). Price: 19 EUR / day (rate subject to changes). Parking located right next to the apartment. Baby cot: Free! Please request on your booking form. Airport transfer: 30 EUR (1-4 pax). 5 EUR extra for late transfers from 10PM to 8AM. Reservation required. The 20% reservation deposit is completely non-refundable. These apartment conditions are in addition to the general terms and conditions. The Magdalena apartment was exactly how shown and described on the website. It was very clean and very well equipped. 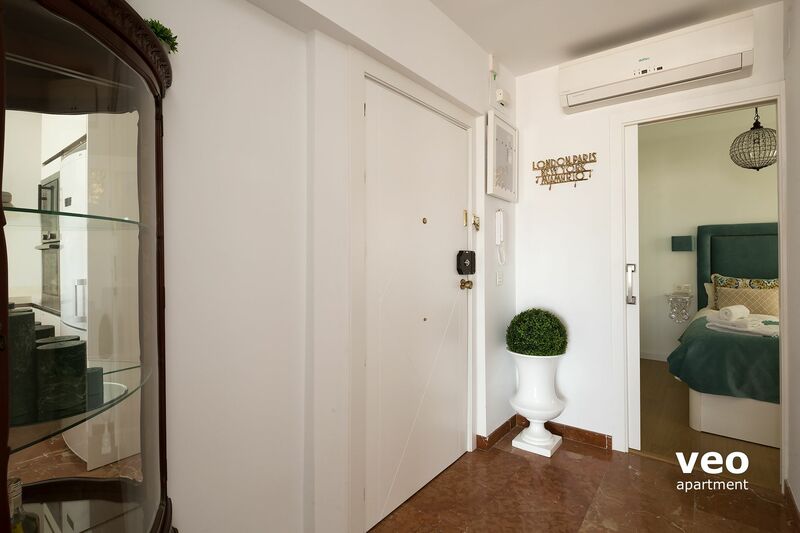 The position of the apartment is ideal for exploring Seville. To the left there is a very good supermarket open all hours and over the river a wonderful market selling the most fantastic meats, fish, fruit and vegetables. A wonderful selection of foods to eat on-site there too. Right takes you to the heart of Seville, the shopping streets and a great selection of bars and restaurants. There is a taxi rank right outside. Would definitely recommend and will be back! "Very nice and quiet Appart "
The apartment was just great for the four of us. It was in a brilliant location, close to all the attractions but also close to shops and the supermarket which we used quite frequently. It was very clean and had such amazing views of the city. "Great apartment in great location!" The apartment is quiet and comfortable and is ideally situated for accessing the main tourist sites in the city; also ideal for popping back to for a break between our sightseeing trips. The apartment is bright and airy and well fitted out. The beds are firm and comfortable and the wardrobe space more than adequate. The bathrooms have great showers with plenty of hot water. There is an efficient dishwasher and washing machine which we used every day. The TV was ideal for watching our own movies. Very close by are two supermarkets as well as places to eat and have a coffee where the prices are 'normal' and not inflated for tourists. I can wholeheartedly recommend 'Magdalena' to stay in while visiting Seville. © 2010 VEO Apartment S.L.